""All I ever wanted was to paint light on the walls of life,"" Ferlinghetti writes in a foreword ""these poems are another attempt to do it."" A late-career miscellany divided into four sections, this eighth collection draws some of life's great polarities light and dark, tragedy and comedy, ecstasy and despair into the quotidian whorl of this beloved West Coast-transplant poet. 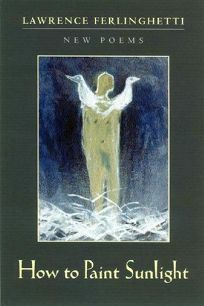 In the eponymous first section, Ferlinghetti combines a familiar blend of direct talk and belief in poetic enlightenment to give voice to the ""Big Sur Light"" (""The moon/ After much reflection says/ Sun is God"") and ""White Dreams,"" and to give ""Instructions to Painters and Poets"": ""stand back astonished."" The ""New York, New York"" section features a ""Manhattan Mama"" and ""Overheard Conversations,"" and makes stops in Europe and China before heading ""Into the Interior,"" the last and best section. There, a series of three poems dealing with Allen Ginsberg's death takes us from the deflectively wry news of his imminent departure (""Death the dark lover/ is going down on him"") to a bedside visitation by the poet's released spirit and beyond: ""Allen died 49 nights ago, and in Bixby Canyon now the white misshapen moon sailed listing through the sky...."" The intentionally over-simple rhymes (""What is light What is air What is life so passing fair? ""), puns (as when he addresses his work to ""the good burghers eating burgers"") and long-winded poetic preaching of the earlier sections may not quite come off, but loss of youth and life and their attendant nostalgias come through, ""made of love and light and dung/ some great immortal song."" (Apr.) Forecast: Fans of A Coney Island of the Mind and A Far Rockaway of the Heart will find this book repetitive and diffuse, but Ferlinghetti has earned it. And since he does not overpublish, fans old and new will pick it up if it is placed in a demographically strategic spot.